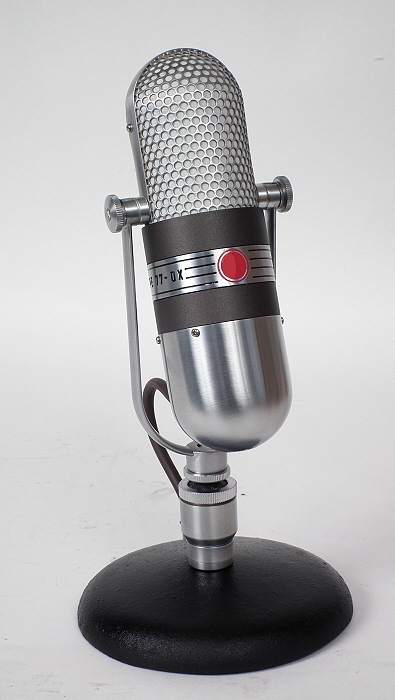 If you like old RCA microphones, and would like to have one for display in your office or front lobby of your station, this is the page for you. These are hand made from quality materials and assembled to look like the famous vintage microphone of the 1950's. They are empty, so you can put your own microphone inside, put them on your desk or in your stations lobby. At less than half of the cost on an original, this is a chance to own a historical masterpiece. They are also great for music videos and other television props. Call or email for more information, or to place an order complete the form below. They are shipped with the desk stand seen in the photos. The 77DX replica with a custom low profile fork. obstruct the view or get in the way. Sorry It does NOT come with desk stand. This is a hand made replica of the rare 77C1. Almost all of the parts interchange with the original RCA 77c1 and are made using the same materials and chrome finish as the original. This is a non working empty shell great for awards, retirement, sales awards & music videos. An option of a large diaphragm condenser mic is available making it a working high quality studio microphone at an additional cost. Replica RCA microphones are built to order and take at least three weeks to complete. You can order via the form below and we will invoice you for payment. Note: Deposit is required on all RCA microphone replica orders. We can invoice you via PayPal or direct mail. If paying by check, we will send you an invoice for your order via USPS direct mail. We will ship to this address when you order is complete.